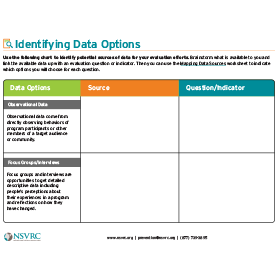 Description This worksheet asks questions to help develop a list of stakeholders for evaluation projects, and is part of the Evaluation Toolkit. 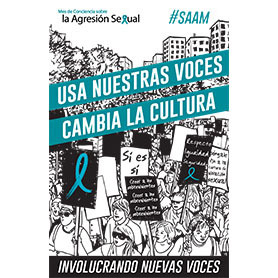 Description A poster created for the 2017 Sexual Assault Awareness Month Campaign that states 'Usa nuestras voces cambia la cultura. Involucrando nuevas voces." Description A poster created for the 2017 Sexual Assault Awareness Month Campaign that states 'Use your voice to change the culture. 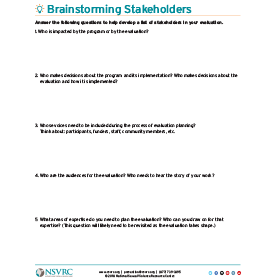 Engaging New Voices." 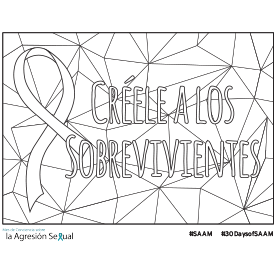 Description A coloring page created for the 2017 Sexual Assault Awareness Campaign that states "Creele a los sobrevivientes." Description A coloring page created for the 2017 Sexual Assault Awareness Campaign that states "Creele y apoye a los sobrevivientes." 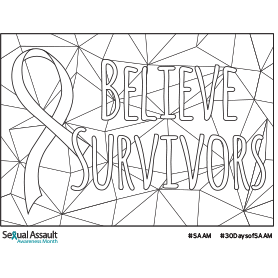 Description A coloring page created for the 2017 Sexual Assault Awareness Campaign that states "Believe Survivors." 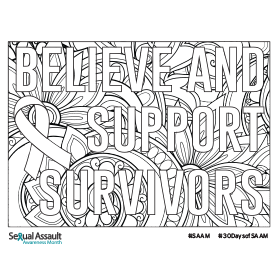 Description A coloring page created for the 2017 Sexual Assault Awareness Campaign that states "Believe and Support Survivors."